Technology can cause sea changes in institutions, operations, and business methods. People still refer to music releases as “albums” even though those grooved discs have not been the primary vehicle for music in a quarter-century. We are all familiar with this consumer shift from albums to magnetic tape to compact discs to today’s streaming music. And we have seen vanquished prior technology in the proverbial bargain basket. But what we often don’t think about is how this progression has impacted the music business. Consider this: Last month’s Grammy Award winner for Best New Artist, Chance the Rapper, has no record label deal and has never released an LP, CD or DVD/BluRay. The only way he releases his music is through direct digital download. That is a sea change that the $43-billion music industry is still grappling with. This “perennial gale of creative destruction,” as the economist Joseph Schumpeter referred to it, is blowing across the real estate industry as well. It is changing the technologies we use, our customers’ expectations and service provider relationships. There are virtually no players in our industry not impacted. CREs have moved from indexed paper files to spreadsheets to relational databases in the cloud to manage their portfolios. But the real changes are in expectations. Many of us are now expected to support financial reporting, safety/environmental tracking, network planning and, with the new FASB rules, may be assuming responsibility for equipment and vehicle leases. It is enough to make me wonder: Am I a CRE who manages data or an IT manager who handles real estate? 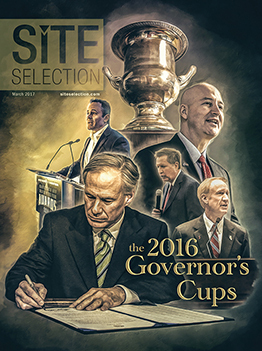 Commercial brokers are encountering their own challenges. Once considered the sole purveyors of real estate knowledge, they now compete with data mining companies for that mantle, and client expectations are changing as well. Rather than just negotiating individual deals, they are being asked to leverage data analytics to drive portfolio productivity and provide global solutions. How will this change client relationships and broker compensation structures? In response to these questions, IAMC is offering programs and conducting research to help members prepare for this new order. Recent programing has included late-breaking technologies, CRE management software offerings, a published white paper on how FASB changes affect CREs and a new task force on artificial intelligence for lease abstracting. 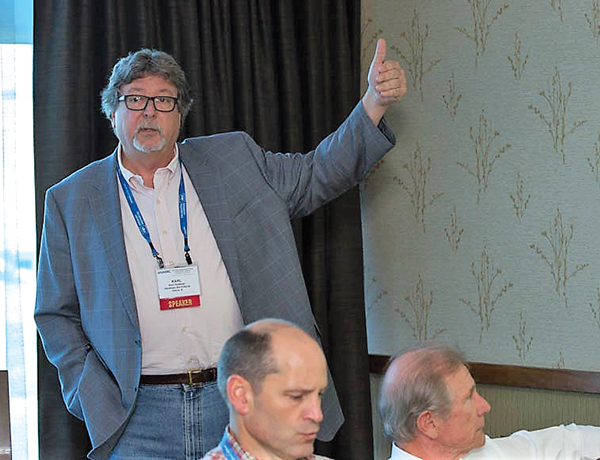 But most importantly, IAMC provides the collegial network where these trends and strategies can be discussed with a balanced group of industry-leading CREs, service providers and economic developers. Hope to see you at the Tampa Professional Forum this April. 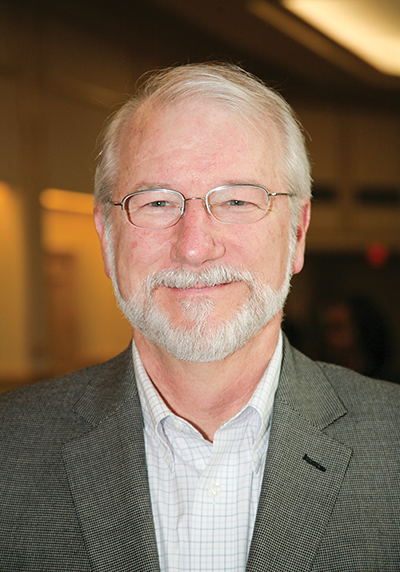 This article is excerpted from an October 9, 2016, Indianapolis Professional Forum Distribution Industry Group program, which was moderated and addressed by Karl Heitman, Heitman Architects. Prologis sponsored the session. Technology is changing the legacy distribution model, as more producers go direct to consumers. This so-called Fourth Industrial Revolution presents an opportunity to create a physical Internet to support distribution that compresses the distance between producers and consumers. Rather than relying on incremental improvements to the current infrastructure, systemic change is needed through public-private partnerships. The Fourth Industrial Revolution will transform the US distribution system. Social pressure to change. People are moving to the more urban parts of metro areas to minimize commutes and maximize the time they spend living, working, and playing. This is driving both supply and waste streams to become locally sourced. Obsolescent infrastructure. The US supply chain is still based on the 1950s legacy model. Today, the country’s infrastructure is obsolete, especially when compared with the digital world where everything is connected globally. Disconnected supply chains. In the 1950s, Main Street was the center of living, working, and playing until the big-box-store revolution killed it. The pendulum is swinging back again, as companies like Walmart launch smaller stores in urban locations to serve growing populations. The supply chain must evolve to meet those needs. Urban mega regions. In the United States, cities are now sprawling megacities, rather than centered around a single node. A good example is the Northeast Corridor, which is a continuous population mass spread along an over-taxed transportation spine. New technologies will change the nature of distribution. Three-D printing is the closest thing we have today to a Star Trek transporter. Once products are printed, many work immediately, on demand. In an ideal world, raw materials for 3D printers would come from a closed-loop supply chain. Plastic and metal from local recycling bins could be used, eliminating the distribution network. Aerial drones may be a solution. Drones eliminate the need to transport goods on roads. BuiltWorlds has created a city in China where loading docks are on roofs to accommodate drones. Not all distribution centers can be automated easily. Distribution centers (DCs) with large numbers of stock keeping units (SKUs) and those with high levels of picking and mixing are not well suited to automation. Some bulk product suppliers are already running automated, so-called lights-out distribution centers that rely on robotics. Orders-of-one put pressure on wholesalers. One participant observed that as his company got larger numbers of orders, the volume of each order decreased, sometimes to a single product. The company had to hire more people to handle larger numbers of orders which cannot be automated easily. Assemble-to-order at the point of consumption is a potential distribution model. In Asia, some distributors have implemented in-plant distribution at manufacturing or sub-assembly plants. One participant has a warehouse located, for example, in a phone manufacturing plant. Robots increase productivity by bringing the pick face to employees. Rather than using a static rack system, some warehouses have installed robots that move dynamic racks to employees for item picking. Self-driving trucks are becoming a reality. Volvo and Mercedes are promoting these vehicles in Europe. Platooning helps increase efficiency by reducing wind resistance. Rather than making incremental improvements to the legacy distribution infrastructure, systemic change may be needed. Examples of revolutionary innovation in transportation and distribution include Elon Musk’s Hyperloop system and the Shareway transportation concept for the Northeast Corridor, which bundles transport systems for freight and commuter rail, trucks, passenger autos, bikes, and pedestrians along a central spine. 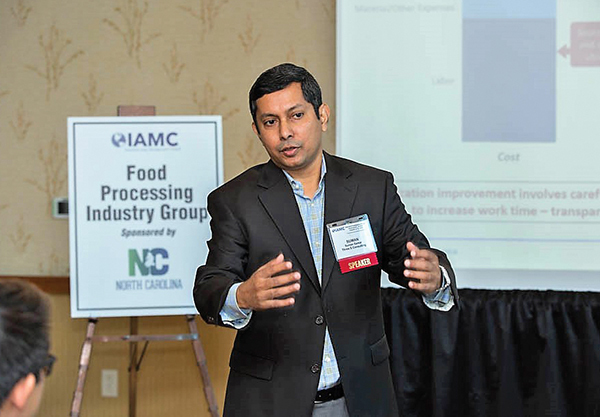 This article is excerpted from an Oct. 9, 2016, Indianapolis Professional Forum Food Processing Industry Group program, which was moderated and addressed by Suman Sarker, Three S Consulting. The Economic Development Partnership of North Carolina sponsored the session. Many organizations have adopted outsourcing as a means of reducing costs. Unfortunately, research has found that many outsourcing activities actually increase costs. The best way to reduce costs is by focusing on suppliers and their utilization. Companies must recognize that improving utilization is difficult. Contrary to conventional wisdom, outsourcing often doesn’t produce cost savings. Cost savings and cost reduction are not the same. Cost savings only focus on a specific portion of the business, not the entire business. For example, every outsourcing contract has KPIs that are tracked closely. If a vendor hits those specific KPIs, there will be cost savings for that specific aspect of the business. However, the overall costs for the business may not decrease. Outsourcing has allowed customers to focus on strategic issues, but costs often increase due to cost-plus contracts and fees. When contracts are structured as cost-plus, there are certain areas where cost savings are not in-scope. Outsourced providers are keen to perform additional services in these areas at an additional cost. As a result, costs increase in areas that are not in-focus for the contract, but decrease in areas specified in the contract. Overall, costs may go up. To reduce costs, companies must focus on market-by-market optimization of suppliers and improved supplier utilization. Facility management costs are mostly associated with labor bought locally. Integrated suppliers suggest that they will do a better job at supplier management, but in most cases, that is not true. It is rare that economies of scale are realized. Instead, the local provider’s cost gets added to the management company’s cost, resulting in higher costs overall. Perceived efficiencies just don’t exist. Since services are bought locally, one solution is to engage in market-by-market optimization. Another option is to increase the utilization of the people providing services. With services, the cost doesn’t come down through scale. Instead, it decreases by making people more efficient. Reducing nonproductive uses of time like wait time and travel time is the best way to increase people’s utilization. Companies must question whether bundling multiple services together through one provider is the right strategy. It is essential to use providers for services at which they are strong. But don’t force providers into areas where they don’t excel. It’s not one size fits all. New technologies could improve supplier utilization. Companies should embrace technologies that improve utilization, as that will reduce costs. A promising new technology similar to Uber is under development. Terminals would be located in three places: 1) at a company that needs facility management services, 2) at the supplier, and 3) at the technology company that assimilates the information. When a service provider, such as a groundskeeper, arrives, the team checks in and takes pictures of the grounds before they begin work. They work for five hours, take pictures after they are done, and then check out. This provides transparency into their operation. Companies can consider how to schedule work to improve utilization and reduce costs, such as giving more work to the provider in exchange for a better price. Eventually, an optimization engine could be added to the system to optimize in real time. One session participant noted that his organization has hundreds, if not thousands, of small distribution facilities that don’t have regular providers or economies of scale. If a facility has a jammed overhead door, it would be great if employees didn’t have to spend time figuring out the best overhead door repair company. A better solution would be something like an industrial Angie’s List. There would be an 800 number that the facility could call with their location and the nature of the problem. The company would identify the highest-rated provider in that area and take a small commission for connecting the two parties.